The Roller Mills String Band is a high energy string band playing old time, Irish, bluegrass, and traditional songs with a focus on the hammered dulcimer. The music is played at a bluegrass push and has been described as “old time music on steroids.” When you come to a Roller Mills String Band show, remember to bring your seat belt and strap in, or you might find yourself up and dancing. WARNING - Fun like this is contagious. The Roller Mills String Band is entering its 6th season of playing together. The band consists of some of the of the most power pickers from several bluegrass bands in Southeastern Wisconsin. Dale Palecek is featured on the hammered dulcimer. Wisconsin bluegrass fans will know him as the former mandolin player for The Lost Marble Band and the former banjo player from the Smoke Chubs. Jim Burch plays the mandolin, fiddle, Irish tenor banjo, and almost anything else with strings in the band. When not playing with the Roller Mills String Band, he can also be heard playing 5 string banjo and dobro in the Big Cedar Bluegrass Band. Mike Stern flatpicks the guitar in the group. Mike and Dale met 13 years ago when they were both members of the Pickin' Up Speed Bluegrass band. Mike would often say to Dale, "Lets put together a band to play old time music and fiddle tunes." Rounding out the group is Charlie Malec on the upright bass. 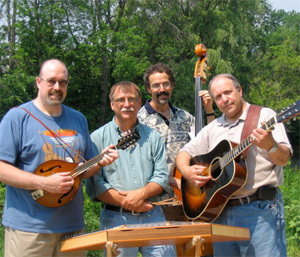 Charlie has been featured in many bluegrass bands in both Wisconsin and in the Chicago area. Dale and Charlie met when they were both together in the Smoked Chubs Bluegrass Band. Visit Roller Mills String Band's Website!